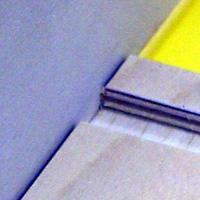 Router Workshop: Dados & Grooves In Drawers. Dados & Grooves In Drawers. 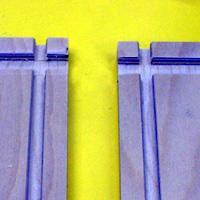 This tip is addressing the important points to making the groove in the bottom of the drawer. What is the difference between the dado and groove and why this is important? What is the correct position of the groove for the drawer bottom? What is the depth of cut? How to pair the parts? How to use plunge forming bits to make grooves? Before we start we are going to discuss the similarities and differences of the dado and groove joint. These joints are set–up and cut with exactly the same procedure, the difference is the groove is cut with the grain and the dado is cut across the grain. This is important because the joints cross paths with the dado in the back of the drawer and the groove in the bottom of the drawer. The order of cut will determine the finish in the bottom corner of the drawer. Do you know what cut to make first? 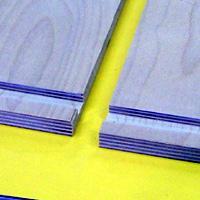 Do we cut: 1) the dado which cuts across the grain or 2) the groove which cuts with the grain. Hint: When we mold the outside of a board, the order of cut is across the grain then with the grain. Answer: The dado is made first then the groove is made to prevent tear out in the bottom corner of the intersection of these two joints. 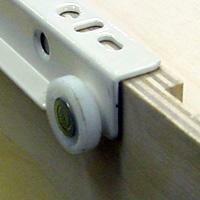 This is important when using glide hardware because the drawer bottom determines how the hardware will fit and operate. It is important to purchase your hardware before starting to make your drawers. We need to get the specs of drawer size and bottom position before starting to make the drawers for the project. 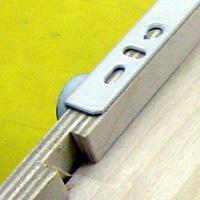 If your not using hardware or making wooden glides the standard distance from the drawer side edge is 3/8”. For this example we are not using hardware so our offset will be 3/8” giving us maximum space in the drawer and good support for the groove joint. 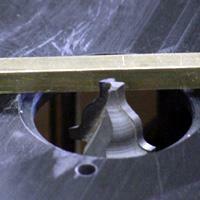 We always use one-half of the material thickness to make it easy to determine the dimension of the parts. 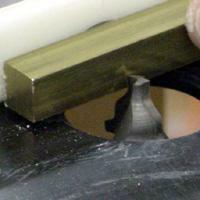 If we set the depth of cut on the groove and dado to one-half of the material thickness we can assume that this cut will leave one-half of the thickness. Two side’s times one-half of the thickness equals one whole thickness so to determine the width of the drawer bottom we minus one thickness from the finished width of the drawer, easy right. The first cut is the dado for the back then we cut the groove for the bottom. When we cut the groove for the bottom we are determining whether we have a right side or left side of the drawer. This means that we need to pair the side to make sure that we have an even number of right and left sides. The easiest way to do this is to lay two sides face to face with the dados together and mark the bottom edge with a pencil. 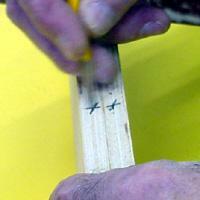 When cutting the groove for the bottom the pencil mark is kept tight to the fence. Plunge forming bits to make a 1/4” groove for the drawer bottom allows the forming bit to slightly round the edge of the groove which allows for easy assembly of the drawer bottom into the groove.